Customers, many of whom had switched to e-reading devices and online stores, are again flocking to traditional bookstores which are offering a wider range of new products. Liu Jiani, 22, a student at the University of Nottingham Ningbo China in Zhejiang province, said that in recent years every time she visited a city, bookstores have been on her must-see list. "There are many beautiful stores emerging across the country that have a nice selection of books, beautiful interior designs and creative cultural products. Even if you visit them many times, you will still find something new," she said. The Bookdao New Publishing Institute, a consultancy to the country's publishing and book selling industry, surveyed 62 chains and found that some 65 percent plan to open more than five new stores this year, and 18 percent of them will open over 100. There were 225,000 bookstores and sales outlets in the country by the end of last year, up by 4.3 percent over 2017. Total sales of publications in the domestic retail sector reached 158 billion yuan ($23.4 billion), a year-on-year growth of 11.3 percent, the report said. Cheng Sanguo, director of the institute, said, "Chinese bookstores, especially private ones, are opening new branches more frequently and have made eye-catching achievements in recent years." Privately owned chains FanDeng Bookstore and Sisyphe Bookstore both said that they will open more than 100 branches this year. The State-owned Xinhua Bookstore has also accelerated expansion. Its subsidiary, Shangshufang, which was founded in 2015, has set up 198 stores in Henan province, while another subsidiary, Xiaojudeng, which focuses on picture books, now has 150 stores in Hebei province. Companies operating online have also been turning to brick-and-mortar bookstores, with major digital media platforms Yitiao and Read at Ten both opening offline outlets. Ji Gang, a partner in Shanghai at global consultancy Roland Berger, said that only a few years ago brick-and-mortar bookstores were hit by the emergence of online outlets, e-reading devices and increased rent and labor costs. From 2000 to 2012, about half of the country's privately owned bookstores closed, while those that were State-owned were struggling. This situation continued until 2017, when bookstore sales increased by 2.33 percent year-on-year, a Roland Berger report said. Dan Jie, founder of the Yanjiyou chain, has experienced these fluctuating fortunes. When his traditional book selling business stagnated, he founded Yanjiyou in 2013. It has opened large bookstores in shopping malls located in central business districts, with the aim of not only showcasing books, but also cultural lifestyles. Dan said all Yanjiyou stores attach great importance to an elegant atmosphere and unique outlook, and many of them were planned by well-known designers. "Every Yanjiyou store has unique designs, which usually absorb both local cultural features and exotic elements, as do the books and products that are on display," he said. In Xi'an, capital of Shaanxi province, a Yanjiyou store that opened in late October attracts about 10,000 visitors a day. On weekends, it has to limit the number. The store was planned by Japanese designer Tomoko Ikegai, who drew inspiration from palace buildings in the Tang Dynasty (618-907). Images of bronze chariots, horses and the Terracotta Warriors were also used for decoration, and the ceiling lights look like book pages swaying in the wind. The 4,500-square-meter store stocks 130,000 books and also includes a coffee shop, an art gallery, a section selling innovative cultural products, and a creative industry incubator. Yanjiyou now has 59 stores nationwide, and plans to open 30 to 40 new ones this year. Some of the newcomers are expected to occupy several floors, each with a total area of more than 10,000 sq m.
Cheng, the Bookdao director, said the revitalization of bookstores is largely due to favorable policies that have been unveiled in recent years. In 2016, a national guideline was issued on support for the bookstore industry. This led to 28 provinces, autonomous regions and municipalities issuing similar policies to boost the sector. For example, since the release of local guidelines in July, 151 bookstores in Beijing have received a total of 50 million yuan ($7.4 million) in subsidies. 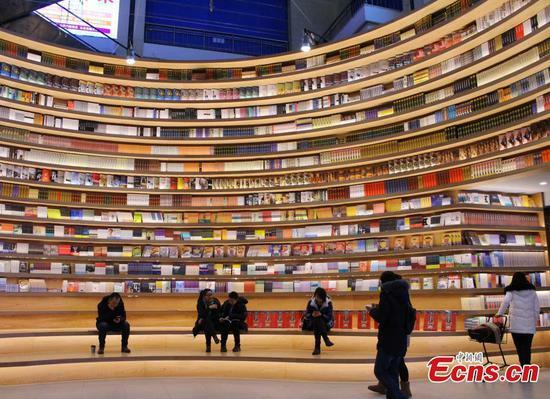 Cheng said the upgrading of cultural consumption has also helped the bookstore industry, as consumers are now demanding more quality content and lifestyles, along with creative cultural products and events. Investors have also seen the potential of the industry. Of the 62 Chinese bookstore chains, about 20 percent have received financing, the Bookdao report said. For example, in December, Yanjiyou completed a second round of financing and has received a total of 240 million yuan from investors. Ji, at Roland Berger, said shopping malls have witnessed the fastest expansion of bookstore chains and have also contributed to their growth, as malls offer low-cost retail space to them, and sometimes even help them to cover their renovation costs. "Bookstores have become an essential part of shopping malls. Apart from bringing in massive human traffic... they also symbolize the elegant cultural taste to be found in malls," he said. Ji added that as consumers now have more diverse and personalized demands, bookstores no longer solely sell books. Many have developed other businesses, including creative cultural products, coffee and fast food, along with hosting various cultural events. He said the bookstores that are attracting readers again are not the traditional brick-and-mortar-style outlets, but are more like cultural complexes. The Bookdao report said that of the 62 Chinese chains, only one focuses solely on selling books, and all but three do not sell food or beverages. All the stores surveyed sell creative cultural products and stationery as well as books. For Sisyphe Bookstore, standardization is important for fast expansion and profits. Sisyphe opened 83 branches last year, and its revenue reached 900 million yuan, up by 73 percent year-on-year. It plans to open 100 branches this year and is targeting revenue of more than 1.5 billion yuan. Hu Lei, general manager of the cultural development center at Sisyphe, said the company defines itself as a boutique bookstore chain for the masses and is dedicated to seeking a balance between its cultural attributes and commercial operations. "Standardization means that whenever consumers enter our bookstores, they will feel familiar (with the products)," he said. "It also means we can quickly replicate our business model." At all its stores, 80 percent of the space is used for books, 15 percent for coffee areas and 5 percent for creative cultural products and stationery. All Sisyphe stores cover 500 to 800 sq m, are located in big shopping malls and have compact layouts. They are all designed in the same European style that is conducive to creating the right atmosphere for reading. "Our target customers are the mass public, and we want to help them cultivate better reading habits and introduce them to quality books," Hu said. Sisyphe has used big data technology to ensure the books in every store match the tastes of consumers in a specific business district. Each year, it selects for sale less than 10 percent of the large number of high-quality publications in China to cater to a mass readership. Books covering specialized professions are not sold in its stores, Hu said. Many other bookstores are linking online and offline sales channels to boost their business. FanDeng Bookstore owes its success to the huge number of members of its online reading community the Spiritual Wealth Club－founded in 2015 by former TV anchor Fan Deng and which now has now more than 13 million users. FanDeng Bookstore, founded in 2016, has more than 200 branches in 94 cities nationwide, and it plans to open 300 to 500 this year. Wu Ning, the chain's founder, said most of its premises are in communities occupying about 200 sq m, enabling residents to browse and read books close to their homes. FanDeng also holds various types of cultural events, inviting well-known authors and online fans to share their thoughts face-to-face on certain books, and to interact with each other. "Online, our consumers can read on the Spiritual Wealth Club ... Offline, they can read and socialize with one another in our bookstores," Wu said. "The 'click-and-mortar' model benefits our business on both fronts." Of FanDeng's 80 million yuan in revenue last year, only 10 percent came from selling books; 30 percent was from sales of creative products; and 60 percent from various cultural activities. Ji said bookstores are on the right track to developing their operations, but most of them have yet to find effective and mature business models. "Relying on government subsidiaries, low rents at shopping malls, or investors' capital is unsustainable, so innovative and disruptive changes are still needed to enable the healthy development of the bookstore industry," he said. He also suggested that bookstores may find opportunities in niche markets. For example, a store that focuses on providing books and creative cultural products solely for children could have great potential.